Rosa Young is actually not on the liturgical calendar of the LC-MS, nor on any liturgical calendar of which I know. The committee that put our calendar together decided to not include any 20th century saints, so she wouldn’t have even been considered. As she is one of my personal heroines, I’ve put her on my personal liturgical calendar. I have selected June 30 as that is the anniversary of her death. Rosa Jinsey Young was born May 14, 1890, in Rosebud, Alabama, and died June 30, 1971. The daughter of an African American Episcopal minister, she is sometimes called the “mother of Black Lutheranism in central Alabama” and she had a lifelong passion for educating rural children, mainly black. After receiving her teaching certificate, she taught for several African American schools across Alabama. 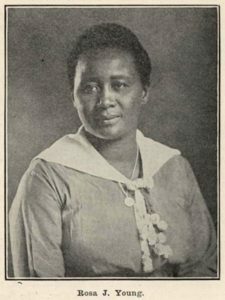 In 1912 she began a private school, with support from both blacks and whites, in Rosebud. While the school began well, the boll weevil arrived in 1914 and devastated the local economy. The school was close to closing when Booker T. Washington suggested she contact the LC-MS, who had a history of starting schools and churches in black communities in Louisiana and North Carolina. She did, and the LC-MS responded with the support she needed. Rev. Nils J. Bakke, a seasoned veteran of the cross, came to Rosebud and together they not only succeeded in saving the school at Rosebud, but aided in founding several more churches and schools in Wilcox County. After a few years, Bakke had to leave the work due to health issues, but Rosa continued. Before she was finished, she saw 35 black Lutheran churches started and 30 black Lutheran schools begun. She was awarded an honorary doctorate (LL.D) by Concordia Theological Seminary in 1961. She is the first black woman to receive a doctorate from any Concordia University System school. Her autobiography is titled Light in the Dark Belt. A copy of the book can be purchased from Concordia Publishing House. She has also been included in the series of biographies titled Hero of the Faith. A movie was made about her by Thrivant, Lutheran Hour Ministries and the LC-MS. It is titled The First Rosa. A complimentary DVD copy of the film was sent to each LCMS congregation. i do not know if the movie is still available to purchase. Below is the official trailer for the picture. O God of wisdom, in your goodness you provide faithful teachers for your Church, like Rosa Young. By your Holy Spirit give all teachers insight into your Word, holy lives as examples to us all, and the courage to know and do the truth of your Gospel; through your Son, Jesus Christ our Lord. Amen.